Going off the tarmac even in SUVs can be tricky. There is a common notion that SUVs can take on any kind of surfaces but most of the time it is not true. Here is an example that shows a Toyota Fortuner and a Tata Safari stuck in the sand. The video is from Patna, Bihar where the official vehicles of a minister and a mayor can be seen struggling to come out of the sand. The vehicles seem to be in the floodplains of the river Ganga which has fine sand. The video shows the Tata Safari being pushed by numerous people and failing to come out of the swamp of sand. Later a JCB comes to the rescue and saves the Tata Safari. 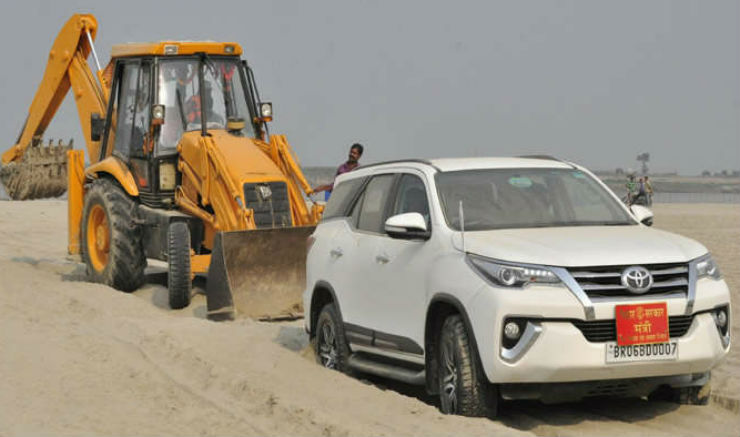 Pictures from the same place also show the current generation Toyota Fortuner being rescued by the JCB bulldozer. SUVs not capable enough for such conditions? The video shows that only the rear wheels of the Tata Safari Storme spinning, which suggests it is a 4X2 vehicle. An SUV offers a high ground clearance, which is very helpful while negotiating bad roads and go over rough surfaces but without a 4X4 system going into sand can be a big misadventure. We are not sure if the Fortuner seen here is a 4X4 as there are no pictures of the rear of the vehicle. A 4X4 system power all the four wheels simultaneously that provides more grip and traction to the vehicle to pass through tougher stretches. Also, the 4X4 system in the Tata Safari is also equipped with the low-ratio transfer case, that increases the torque output on the lower revs and can help the vehicle to get out of such situations. Similarly, the Fortuner also seems to be the 4X2 variant and has struggled to get out of the situation. The 4X4 systems can sure power all the four wheels and can help the vehicle in some situations, there are many other factors that account for the capability of the vehicle. Here are a few things that should be kept in the mind while going off the tarmac. Walk the path. Walk on the trail or surface on which you intend to take the vehicle. It will give you a fair idea of how slippery, wet or sticky the situation is. Never do it alone. Always keep a back up for the rescue. Even the greatest 4X4 vehicles can fail and get stuck and without help, you can be stranded for hours or days. Always engage the 4X4 mode in your vehicle before entering a trail, the 4X4 system will help you to not get stuck. Once you get stuck and switch to 4X4, there would not be much help. Always be careful of your surroundings. A difficult looking path may turn out to be easier than an easier looking path.